Great accent rug, adds a fun pop of color to our room and it’s easy to clean. 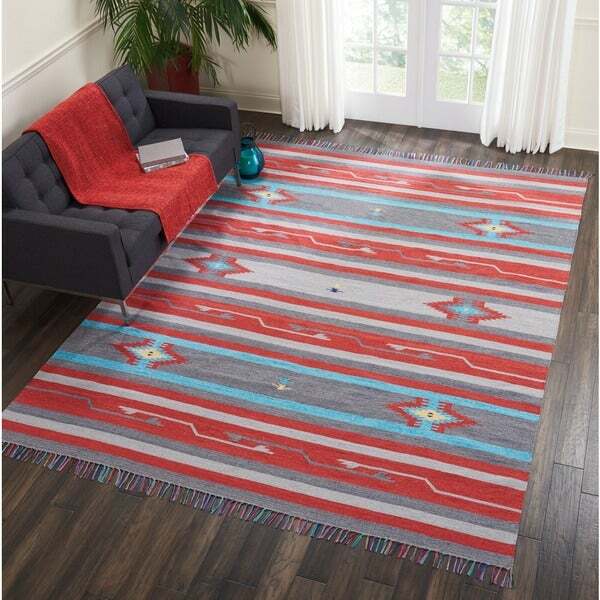 Nourison Baja Moroccan Grey/Red Area Rug - 6'6" x 9'6"
Nourison Baja Reversible Ivory Grey Area Rug - 6'6" x 9'6"
Sun washed red and heathery grey dominate the design of this Ikat style area rug from the tribal Baja Collection. Details in yellow and turquoise add another bright touch to enliven your room. Stripes, medallions and wonderful abstract vines create rhythmic graphic appeal in a flat weave, kilim area rug designed for casual elegance. Reversible for twice the wear! Exact Size: 3'6" x 5'6"
Dimensions 42in. x 66in. x .25in. Nourison Baja Moroccan Red/Beige Area Rug - 3'6" x 5'6"
Nourison Baja Reversible Yellow Area Rug - 3'6" x 5'6"
Nourison Baja Moroccan Ivory Area Rug - 3'6" x 5'6"